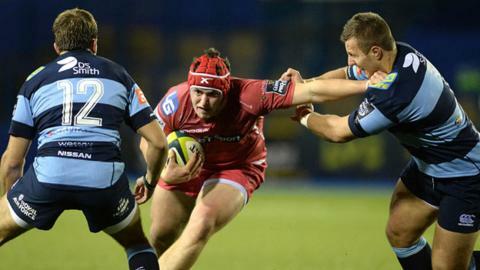 Cardiff Blues recorded their second successive LV=Cup win with a hard-fought 19-13 success over Scarlets at the Arms Park. Captain Ellis Jenkins scored their only try, with Simon Humberstone converting and kicking three penalties and Will Thomas adding a fourth. Scarlets' try was scored by flanker Sion Bennett, with Josh Lewis adding the conversion and two penalties. Prop Taufa'ao Filise made a record-equalling 182nd appearance for Blues.